(MissionNewswire) Share the Light is a nonprofit organization created from projects developed by staff and students of the Salesian College Farnborough in the United Kingdom. The organization focuses specifically on helping youth in Mazabuka, a town in the Southern Province of Zambia. Having grown in recent years, Share the Light now includes a Scholarship Program, a Porridge Club and the City of Joy orphanage. The connection to the town of Mazabuka was developed by Richard Maher, a former student at the university who spent several years living and working in Zambia after graduation. While he was there, he met Mrs. Mweete, the head teacher at Luyobolola Community School in Mazabuka, who has been instrumental in founding the Share the Light organization. As head teacher, Mweete noticed that an alarming number of students were dropping out of school due to a lack of sponsorship and it was through her determination to combat this crisis that Share the Light was founded. Share the Light helps support the City of Joy orphanage run by Salesian Sisters in Mazabuka. It is home to a growing number of girls and young women who are unable to live with their families. Share the Light aims to meet the residents’ medical and nutritional needs and provide them clothing, school uniforms and school equipment. In addition, Share the Light provides transport to enable groups from the City of Joy to travel out together in safety. Share the Light’s Scholarship Program provides children and older youth with access to education, enabling them to achieve their goals and pursue a brighter future. It offers both financial and practical help to students at all levels of education. The organization also focuses on nutrition. Its Porridge Club has become Share the Light’s longest running project. The club provides daily nutritious meals to the 700 students attending Luyobolola Community Primary School. The porridge provided at school not only gives children vital nutrients, it has improved their attendance and ability to concentrate and learn. Share the Light’s Nutrition Program also works to support the community in Mazabuka by providing essential food items, clothing and blankets for those who are sick or out of work. It has proved to be an essential lifeline for those in need. A long-term goal of Share the Light is for it to be operated by its advocates. A growing number of the Salesian College Farnborough’s graduates meet every year to share their experiences, ideas and objectives for the organization’s future. 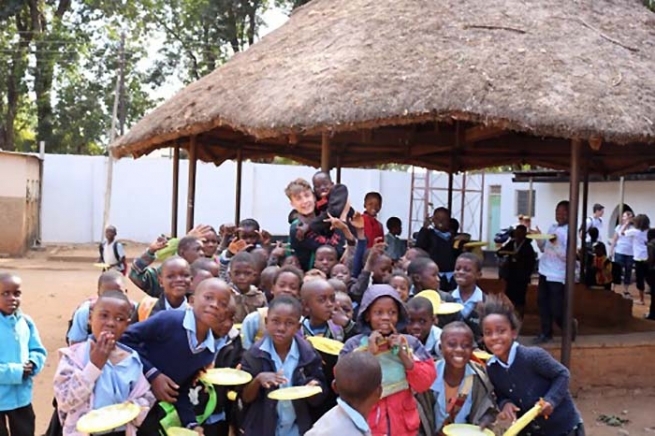 In 2012, the first group of advocates spent two weeks in Zambia where they had the opportunity to experience first-hand the value of the work being done by the City of Joy orphanage in the wider community. This experience inspired all twelve student advocates and became the foundation for the Advocates Program.